The foreign trade in agricultural and food products is a significant reflection of an economic situation occurring in the current functioning of agriculture, food industry and its individual trades in a given country. It is worth considering how the export of Polish agricultural and food products may be compared with the Vise grad Group countries in this area. 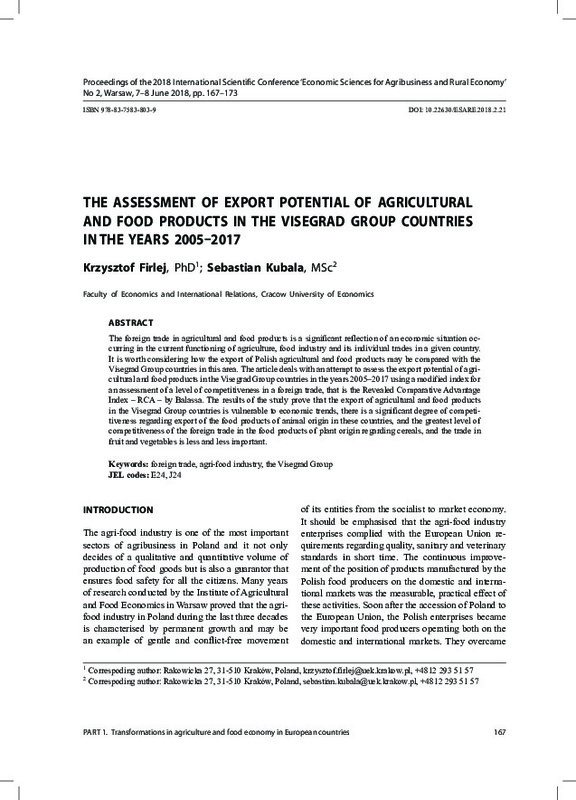 The article deals with an attempt to assess the export potential of agricultural and food products in the Visegrad Group countries in the years 2005–2017 using a modified index for an assessment of a level of competitiveness in a foreign trade, that is the Revealed Comparative Advantage Index – RCA – by Balassa. The results of the study prove that the export of agricultural and food products in the Visegrad Group countries is vulnerable to economic trends, there is a significant degree of competitiveness regarding export of the food products of animal origin in these countries, and the greatest level of competitiveness of the foreign trade in the food products of plant origin regarding cereals, and the trade in fruit and vegetables is less and less important.